De geluiden komen mij wel ergens bekend voor kan ze niet helemaal plaatsen. The sounds get me somewhere familiar, but can not quite place it. Prettige feestdagen, een gelukkig, voorspoedig maar vooral gezond nieuwjaar. 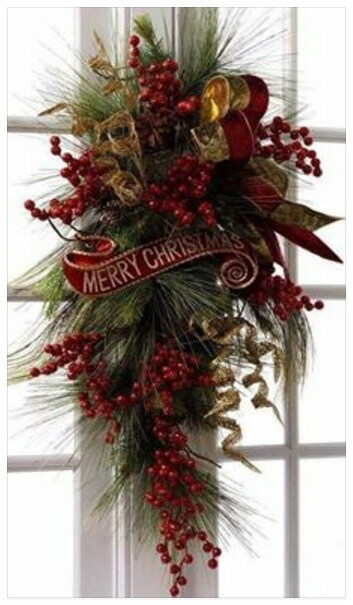 Merry Christmas, a happy, prosperous and especially healthy New Year. In deze mail staat een link waarop het negenentwintigste DKARS-Magazine is te downloaden. This mail contains a link which the 29th- DKARS-Magazine is available for download. Of course, my favorite book about growing up in rural America (or at least Ohio :-) is of course, "The Brasspounder" by D. G. Sanders and of course he was a railroad telegrapher. I reviewed it some years ago in "Dots & Dashes" but it is probably a good time to mention it again. If you don't already know about this book, it is an excellent and heartwarming read. There's actually two books I know of with "brasspounder' in the title. The first, of course, is "The Brasspounder" by Sanders which is essentially an autobiography mostly about the first roughly 25 years of his life and his experiences becoming a telegraph operator. It was published in 1978. The other is, "Brasspounders: Young Telegraphers of the Civil War" written by Alvin F. Harlow and published in 1962 (Harlow was a prolific writer, another of his books is, "Old Wires and New Waves".). and the name of the store in at least some ways described the proprietor that day. As I recall when I walked into the store he was wearing crossed bandoleers with pistols in each one. Underneath the title on the title page of the book someone had penned, "about damn yankees". Of course Kennesaw was the location (then called Big Shanty) from which the General was purloined at the beginning of its run north. through which the General fled from the pursuing Texas (which at the time I did all this, fall 2006 while working on a CSX hump yard in Atlanta, Tilford Yard, was displayed in Atlanta and I saw it too although I think it has now been moved. I'm sorry for the inconvenience you had with order. We don't accept Paypal as a payment method on our website at this point. For Magazine subscriptions we accept credit cards, debit cards, Amazon.com Gift Cards, and Amazon Payments Stored balance. You can also use your friends card or your family member card to order on our website. Although I spent about two thirds of my working life designing computer control systems for hump yards, this is one I was never involved in. It is a big one although both CSX's Selkirk Yard outside Albany NY and BNSF's new Argentine Yard just west of Kansas City are quite large and I was deeply involved with both of those. My favorite, however, it BNSF's Northtown Yard in Minneapolis, also a good sized yard. It was one of two yards I did twice, once when it was new in 1974 and again in 1993. I last visited it in 2004. Although I never worked for US&S and in fact worked for their primary competitor GRS for almost 20 years, there is now a page on a web site for retired US&S employees called the "Has Beens" (better a has been than a never was :-) titled, "The Memoirs of Chris Hausler". It looks at my early years in the 1970's working for GRS doing hump yards. There are several downloadable documents in .pdf format including a number of photographs describing that era in my life and even a little about my high school days. There's a lot of interesting railroad history which can be seen on this site including a monthly magazine called "Flakes of Rust" which includes many old ads, both US&S, GRS and others which can be reached from links on the above page. Now I got today a nice present from Tony VK3CAB -- he gave me a beautiful home made Side Swiper. I have never had or tried one before! So now I have elkey, pump, bug and jigger all in parallel so I can hope between them. But I need to practice the jigger, it is very different, as each side dit and dah is mechanical and you alternate back and forth, you have to relearn! Did you ever try using a sideswiper? I did not know TY2AC before, I hope to meet some time! Jean, 5T0JL and I made some tests yesterday, between Mauritania and Arizona. We tried to contact each other on 17, 15 and 12 metres, between about 1600 GMT and 1700 GMT. Propagation predictions put this time period as the best for the path between 5T0JL and AA7FV. We were successful on 17 metres, with very good signals both ways, which were steady for about an hour. However, we were unsuccessful on 15m and 12m. After these tests, I looked more closely at the antenna patterns of my rhombic in Jean's direction. Yann thought the results might also be of interest to this group. It turns out that my rhombic has something like a null in its response towards Jean on 15 and 12m, while there is a sidelobe peak in his direction on 17m. This alone could account for the results of our tests, although undoubtedly the ionosphere has the last say in all this. Here's the 12m pattern. This is outside the normal wavelength range of the rhombic design. North is to the top. On 12 metres, there really isn't a single main beam at all. It's broken up into separate sidelobes. There is still a lobe towards central England at 35 degrees, but it's not the strongest one. 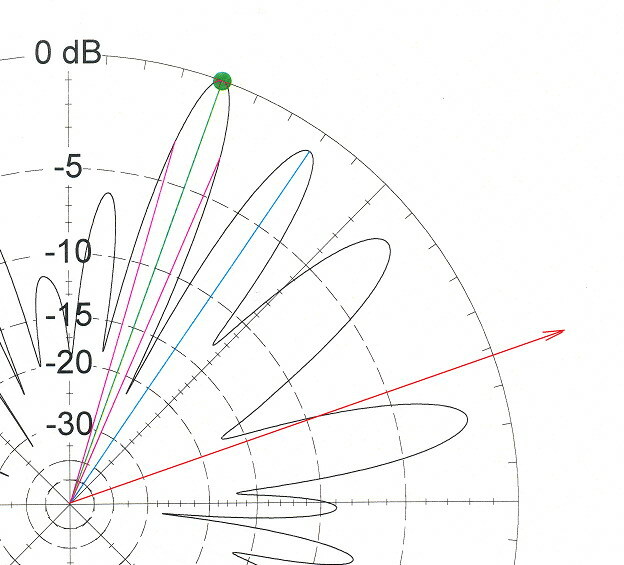 The dB scale is just relative to the strongest lobe, wherever that is. This is higher in frequency than the rhombic was designed for. The red arrow marks the 5T0JL direction from AA7FV. As you can see, it's very close to a null in the pattern. Here's the pattern for 15m. This is the highest frequency the rhombic was designed to work on. 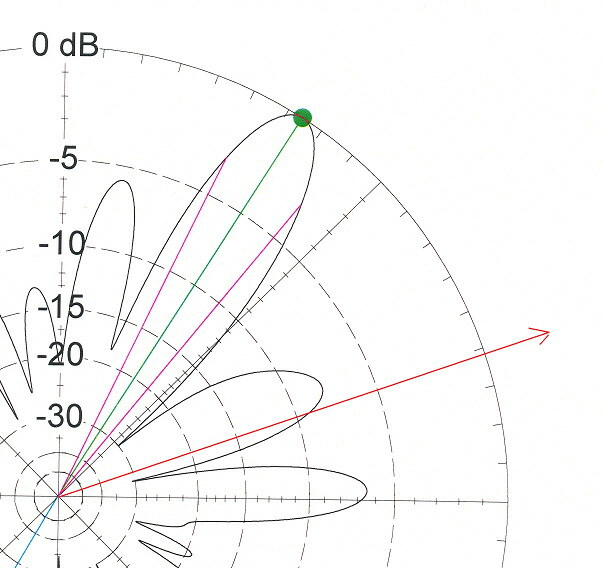 The strongest lobe is at an azimuth of 33 degrees, which points to central/northern England from Tucson, Arizona. Again, the red arrow points to 5T0JL, at azimuth 72 degrees. You can see it's almost exactly in a null of the pattern. You can see the biggest peak is at azimuth 32 degrees, which is northern England from Tucson. As before the red arrow marks the direction towards 5T0JL. It's fairly close to the sidelobe that peaks at about 69 degrees azimuth. Just looking at these 3 patterns, I'd say that the chances of contact with 5T0JL from AA7FV on 15m and 12m are fairly slim, while 17m looks by far the best. Then, added to the vagaries of propagation, it makes a lot of sense that we found the best path on 17m. The above plot is for an elevation angle of 6 degrees. North (0 degs) is at the top and East (90 degs) to the right. 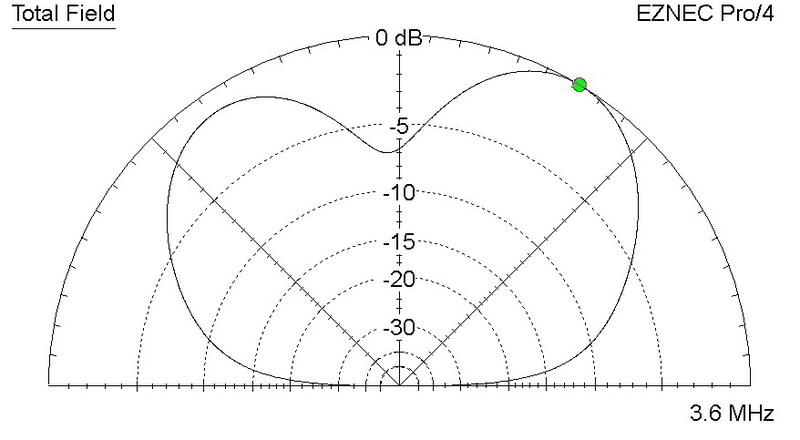 Your direction (72 degs) is within about 1 dB of the peak of the horizontal pattern. However, my vertical pattern on 80m is hopeless. 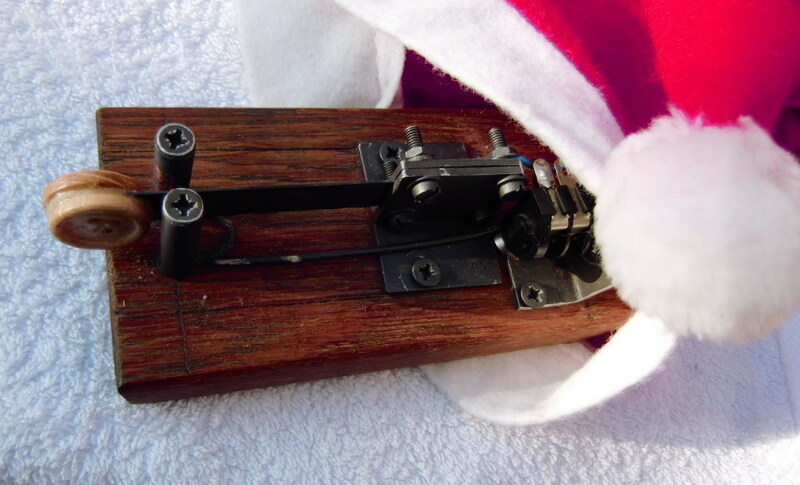 This is the cut in the vertical plane at your azimuth, i.e. 72 degs from AA7FV. This is clearly not a DX antenna on 80m. Just taking the information from your QRZ.com entry, from AA7FV your bearing is 54.9 degrees. 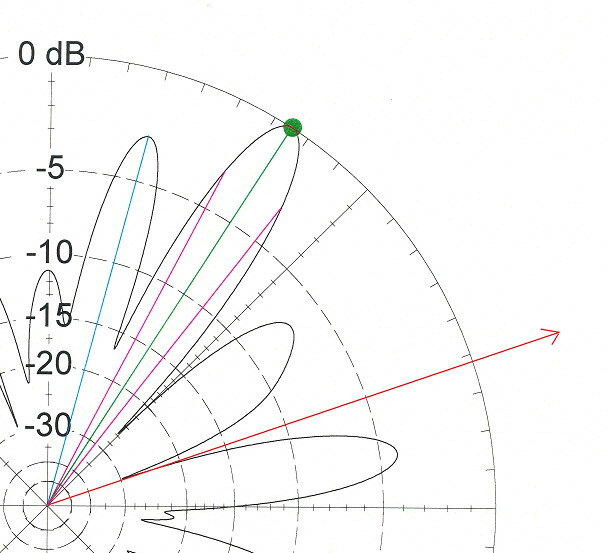 On all the plots of my antenna patterns I posted, 0 degrees is at the top, and 90 degrees is horizontally to the right. 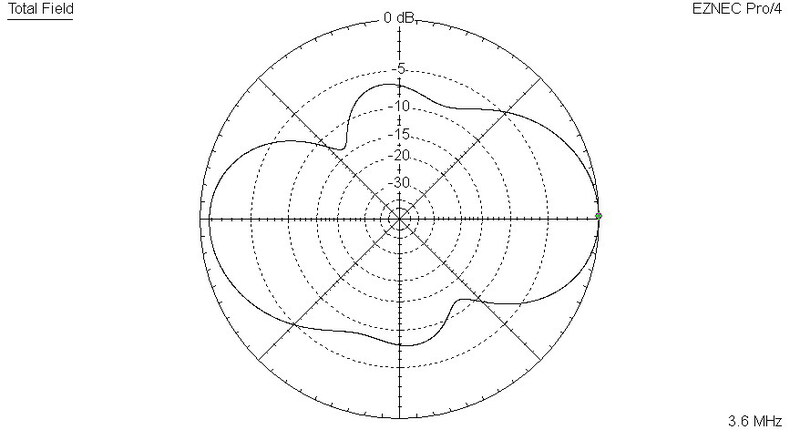 The ticks around the circumference of the plot are every 5 degrees. So, you can easily put your bearing on the plots. Unfortunately, it's in a very poor direction for my antenna on most bands. It's a method-of-moments calculation, developed at the Lawrence Livermore National Laboratory in the USA. Until a few (10?) years ago the professional version of this (NEC-4) software was only available to US nationals - I think the fear was that it could be used to calculate too accurately the radar cross-sections of missiles and military aircraft and vehicles. Then, about 10 years ago, the professional version was made public. Earlier versions of NEC have been available for many years, and are the basis of well known programs such as MININEC. In the original version of NEC, the data input was based on card images, and was rather tedious and it was very easy to make mistakes. Roy Lewellan, W7EL later developed a very nice GUI on top of the NEC Fortran software, and called it EZNEC. There have been several versions of EZNEC. Welcome aboard my friend, and hope you'll soon join the fun on the air. BTW, invitations sent to David, VK2JDR; Tony, VK3CAB; Peter, VK4QC. With Doc, VK5BUG (160m and LF) and Steve, VK7CW there are potential participants enough to establish a regional or Oceanian SSN session, please keep us informed, thanks! Congratulations to David, VK2JDR on his cootie page, I'll put a link to it on the website. BTW, the following articles might be of assistance to some beginners: "Sideswiper Net", by Bob Shrader, W6BNB, founder of the SSN, our great man. "Modernization of an Old Favorite or, the Sideswiper Revisited", by John J.Myers, W9OK (ex W9LA), a tongue-in-cheek article. Welcome to our new VK friends!